Your freezer can be an incredible source of savings, or it can be the black hole where mushy vegetables and half-eaten pints of ice cream go to die. To help you remember how long foods keep and how to properly freeze them, The Huffington Post shared this great infographic on freezing food. Who knew you could freeze yogurt? Who knew fried chicken is still good after a third of a year in the deep freeze? With the power of this chart, you can stock up when you have coupons, during a sale or when produce is in-season, stretching your grocery budget and helping you save money. Of course, your ability to save depends on actually using the food you freeze, and the likelihood you’ll do that is directly related to how good the food tastes after it thaws. Here are some tips to make sure your freezer food tastes like food, not freezerburn. Don’t put hot or warm food in the freezer; you should always wait until your food is cool, according to the University of Nebraska-Lincoln’s extension office. Pack your goodies into freezer bags, which are thicker than regular zip-top bags. Don’t use Tupperware or other plastic containers, since those won’t let you remove all air from the container. 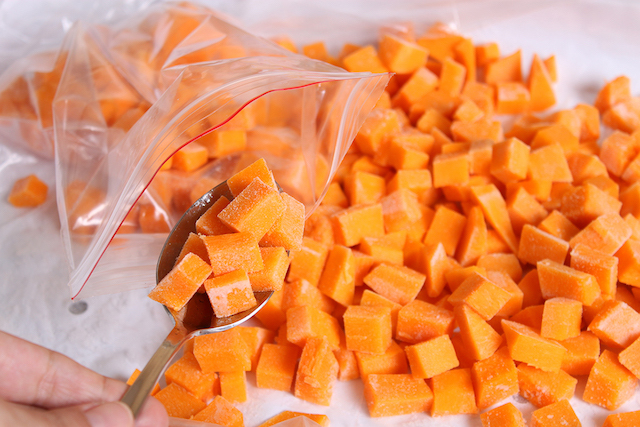 Flatten out the bag until the contents freeze, and then stack it with other freezer bags or even store the bag vertically on its edge. Don’t forget to label your bags with the name of the food, the date you froze it and any other helpful information, such as measurements. You can freeze almost anything, from raw meat (between three and 12 months depending on the type of meat), to milk (three to six months) and even cookie dough (three months). To make mealtimes easier, consider freezing pre-cooked items, like pasta sauce (12-18 months, according to the University of Minnesota’s extension office) or full meals you’ve prepped in advance, like casseroles and enchiladas. You can either pre-bake the meals and freeze them for up to three months, or assemble them without baking and pop them straight into the freezer. They keep two to four months this way, according to the University of Wisconsin, and you can cook them without even thawing afterwards by doubling the original cook time and subtracting about 10 minutes. For example, if a casserole was originally supposed to be baked for 30 minutes, try baking it for 50 minutes, but set a timer to check on it in about 40 minutes to make sure nothing is burning. Some things just don’t freeze well. Potato salad or chicken salad are on that list, as are raw and hard-boiled eggs — though you can freeze raw egg whites or egg yolks once you crack the shells open. Mayonnaise will “break” as it thaws and the eggs and oil separate, which is gross. Half-and-half will also “break” if frozen, but heavy cream is OK.
Don’t freeze any liquids in glass containers, because the liquid will expand as it freezes and perhaps break the glass, and don’t — no matter what anyone tells you — keep coffee in the freezer, unless you like your coffee to taste like the freezer smells. Using your freezer to store food takes a small amount of planning and work, but it’s all worth it when you pull out a pan full of manicotti or lasagna and have dinner ready with almost no effort — and for pennies per serving. For more information on what — and what not — to freeze, read the full infographic on HuffPo. Your Turn: What are your favorite meals to freeze?